SatNav: Search for Templehouse Demesne, Sligo. Try our postcode too F56 NN50. 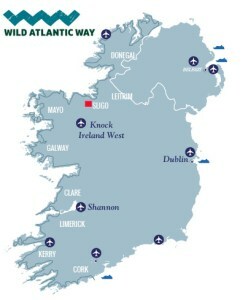 Temple House is very central just off the N17 Galway – Sligo road a mere 10 minutes off the Wild Atlantic Way. The easiest way to find us is off the N17 Galway to Sligo main road. 9km from Collooney N4/N17 junction, take brown sign left 0.5km south of Ballinacarrow. Through Tubber/Tobercurry then after 15km at village sign for Ballinacarrow turn right. Ballymote train station on the Sligo-Dublin line is a 6 minute taxi ride from us.